Cilbir or Turkish eggs is a very simple, hearty and nutritious breakfast recipe. 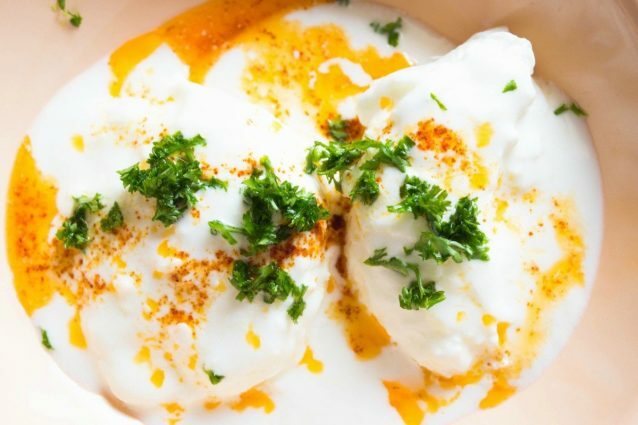 This recipe resembles the classic poached egg preparation with a heavenly Turkish twist. Serve your cilbir with a multi grain bread toast, a bowl of fresh fruits, and your early morning nutrition is absolutely sorted! In a small bowl add the grated garlic, a pinch salt, yogurt and whisk the ingredients together until well blended and smooth in consistency. In a pot boil the water until it starts to bubble. Add the vinegar and ½ teaspoon salt to the boiling water. Reduce the flame. Break open the egg in to another separate bowl. Now, add the broken egg to the simmering water and let it cook in it for 2 to 3 minutes undisturbed. Increase the heat to medium and let the egg cook again undisturbed for another 3 to 4 minutes for a soft cooked egg. Repeat the process with the second egg as well and cook to your desired degree of doneness. Remove the poached egg with a slotted spoon in to the serving dish. Pour the yogurt mixture evenly over the poached eggs. Melt the butter in a ladle and add paprika to it. Cook for about 5 seconds and lightly stir the butter and paprika together. Remove the ladle from the heat and drizzle the paprika butter evenly over the yogurt layer. Top the cilbir with fresh parsley and enjoy! Break the eggs into a separate bowl carefully so that they do not have any bit of egg shells in it. You may increase the cooking time by another 5 minutes if you prefer hard cooked or fully cooked egg. Choose from low fat to full fat yogurt, based on your taste preference. Heat the butter carefully and not burn the butter by prolonging the cooking time. Serve the cilbir with a multi grain bread toast to enjoy it best. You may reduce the butter and paprika quantity in half to get an even healthier version of this Turkish eggs recipe. 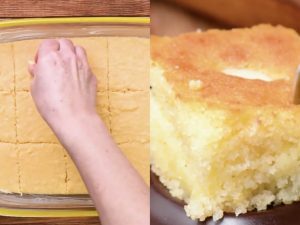 Basbousa: the original recipe step by step!